As the number of people battling chronic disease rises, the importance of advocating for the community becomes paramount. 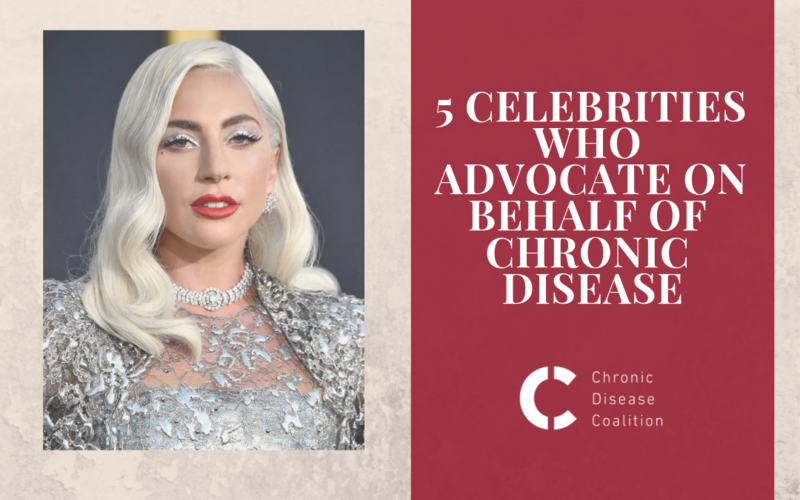 Several celebrities are choosing to share their chronic disease experience in an effort to raise awareness, lessen the stigma and be supportive allies. Below are five celebrities that are speaking out, sharing their experience and advocating for patients with chronic disease. Oscar-nominated star Lady Gaga was diagnosed with fibromyalgia in 2016. Like many fibromyalgia patients, Gaga suffers from pain, fatigue, disrupted sleep, migraines and mood disorders while trying to balance life and a career. Gaga actively shares her experience battling fibromyalgia and the social stigma that accompanies life with an invisible illness through social media. Gaga speaks openly about her journey with fibromyalgia in her recent documentary “Gaga: Five Foot Two,” where she shares her unfiltered experience and everyday reality of living with fibromyalgia. Thirteen-year-old Nick Jonas was pursuing a music career as part of his family’s band, The Jonas Brothers, when he was diagnosed with Type 1 diabetes. Through consistent care and doctor visits, Jonas continues to embark on creative ventures while managing his condition. Since his diagnosis, Jonas has become an advocate for diabetes patients, contributing to philanthropic organizations and supporting research on behalf of all chronic disease patients. In 2015, Jonas co-founded Beyond Type 1, a nonprofit organization dedicated to providing educational materials and resources for those living with Type 1 diabetes. “Modern Family” star Sarah Hyland is no stranger to hospitals and procedures as she battles kidney dysplasia. Over the last 16 months, Hyland has had six surgeries, including second kidney transplant, laparoscopic surgery for endometriosis and surgery to correct an abdominal hernia. In her lifetime, Hyland has had 16 surgeries. Hyland chooses to make her voice heard throughout her battle with the chronic illness. In a video interview with “Self” magazine, Hyland shares her powerful story and the importance of persevering through the pain and rising to be an advocate. “Back to the Future” actor Michael J. Fox was diagnosed with Parkinson’s in his early life. Parkinson’s is a neurodegenerative disorder that slowly attacks neurons in the brain, causing patients to have regular tremors. Advancements in medicine have allowed Parkinson’s patients to live successful lives. “I was diagnosed 25 years ago, and I was only supposed to work for another 10 years. I was supposed to be pretty much disabled by now. I’m far from it. This is as bad as I get, and I can still go to the store and go marketing,” Fox told the “Today Show” in 2017. In 2000, Fox founded the Michael J. Fox Foundation, which actively funds research in pursuit of a cure for Parkinson’s. Fox also uses the foundation’s podcast to engage in conversations about living with the disease. Selena Gomez publicly shared her diagnosis with lupus in 2015. Complications with her condition lead to intensive chemotherapy treatment and eventually, and a kidney transplant. While she was recovering from her transplant, Gomez, seized the opportunity to share her story and educate those on the challenges that accompany chronic disease. Chronic disease affects everyone differently, but there are a number of shared experiences that unite us. These five celebrities are standing up and speaking out about the importance of being an advocate. Become a part of our community and join us to help change the conversation on chronic disease.